Back in 1968 I ran an experiment on temperature and young gupps. I split a dropping of fry … kept one half at about 72-75 degrees and the other half I kept at about 80-82 degrees, both in 10 gallon tanks with approximately 40 fish in each. In order to compensate for the high metabolism due to heat and the extra feedings necessary in the 80-82 degree tanks, I fed both tanks the same amount of food … just to prove it was not the food or the amount of feedings that did anything for the batch in the warmer water. Inside of four months all the fish in the 80-82 degree tank either had crooked bodies or had died, while in the other tank all the fish were good … some of them even went on to win best of show at a lot of shows. 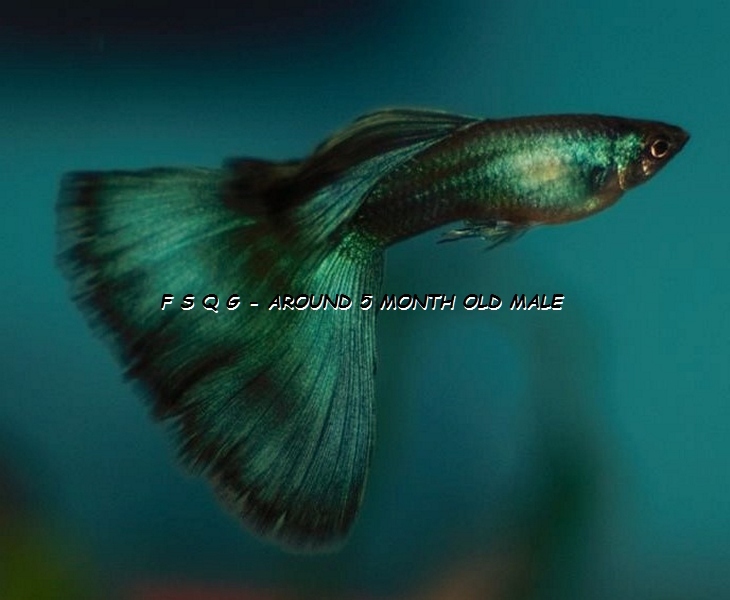 Now when I get a female I want fry from, I put her in either a 3 1/2 or 7 1/2 gallon tank in a breeding trap. When she has dropped out l leave the fry in the tank for approximately 3 months at the temperature of my fish room – about 72-74 degrees. For the first month I feed Tetramin baby food as often as I can… about every hour when I am home, plus freshly hatched brine shrimp twice a day. When they look to be getting crowded I put them into a 10 gallon tank. At this point, I start my culling, getting rid of the first males who start showing a gonopodium or interest in females, for l feel these are going to be smaller fish. When I feel the time is right, I put all of the remaining dropping into a 20 gallon tank with an outside and two inside filters with lots of agitation in the water. This makes the fish swim and gives them a strong peduncle to hold up any size tail they may get. When I see the type of fish I need for breeders, I take them back out of the 20 gallon and put them into a 10 gallon again where they mature to show fish size. When I take the fish out of the 10 gallon to put them into the 20 gallon, they will be about 6 months old. When I pick out my fish to breed, they may be 8 to 9 months. And when they reach their peak it could be 11 to 12 months and I can keep them that way for maybe 8 months … or the best part of the show year. The reason I feel small tanks are good for fry is the fact they do not have to go looking for food, as it is under their noses all the time. Then when I take them out of the large tank back to the 10 gallon, they don’t have a lot of swimming area to rag up the ends of the caudal, and there are always lots of females there so that if one gets away, there are more and the males don’t tire themselves out. I feel strongly about this as I have explained it. I put a bunch of fish in a 40 gallon that I built just to see what would happen. It was a long 40 (39 x l6 x l6) and they turned out to be the worst garbage I had ever seen. I also feel strongly about feeding, that plus culling, the right tank size at the right time, along with the right temperature will give good results. With lower tank temperatures the fish grow for a longer period of time, plus getting bigger and more proportionate. To keep guppies healthy and disease free … remove all waste regularly from your tanks! This entry was posted in Guppies - breeding, Guppies - water temp., Guppy Blog - Guppies corner and tagged experiment on temperature and young gupps, Temperature guppy tanks and young guppies. Bookmark the permalink.